The open season is finally here! We open our doors to the public for the first time in 2019 on Saturday 13th April. We will be open every day until Thursday 18th April (including the Monday!). We will be closed for Good Friday (19th April) and Saturday 20th April, as we prepare for our Vikings Event. The low season will begin fully on Thursday 25th April 2019 and we will be open on Thursdays, Fridays, Saturdays and Sundays. Please visit http://tutburycastle.com/opening-times-entrance-fees/ to find all the details of opening times and entrance fees. And what better way to begin the season with a visit from the fantastic Svartland Vikings? They will be at the castle Sunday 21st and Monday 22nd April 2019. This event has proven to be extremely popular in the past and is a perfect day out for all the family! Visit http://tutburycastle.com/events/vikings-at-tutbury-castle/ for more details and to book tickets. I still find it so hard to believe that site where Tutbury Castle now sits was settled on during the times when Vikings were invading and settling in England. We have archaeological evidence that shows that the site has been used since the Mesolithic period- 10,000 years ago! We don’t have any direct evidence that the Vikings came here, but a large Viking army spent the winter of 873-4 at nearby Repton, where they destroyed the monastery, and tradition tells us that they also raided the church at Hanbury, so that the relics of St Werburh (an important local saint) had to be moved to Chester for safety. The name Tutbury means ‘look-out fortification’ in Old English, so we can be reasonably certain that the Castle site was an Anglo-Saxon fort at the time. So, either the Vikings were here themselves, or the Anglo-Saxons were here keeping an eye on the Vikings. The Vikings came to the area as raiders (the name Viking means ‘pirate’ or ‘raider’), but after their initial conquest they settled down and became part of English society. The early raids explain their reputation, especially as churches and monasteries were often targets for Viking raids because of their wealth, and most of our surviving accounts were written by monks. A bit of bias there, I think! The Svartland Vikings will be demonstrating the combat skills of the Vikings, but they will also be showing their more peaceful side, as traders and craftsmen. The Viking settlers in England played an important part in the development of towns and trading networks, and the nearby River Trent became an important trade route connecting this heart of England with the wider Viking world. This is reflected in Svartland’s wonderful Living History displays, so come along and see how much more there was to this period than the ‘Vicious Vikings’ reputation. Continuing our peaceful theme, the name of the month April is thought to derive from the Roman goddess Venus, also known as Aphrodite. ‘April’ almost certainly comes from a version of ‘Aphrodite’, as many of the Roman months were named for gods and goddesses. Venus/Aphrodite was the goddess of love, and here at the Castle we like to celebrate love as well as the Castle’s warlike history. 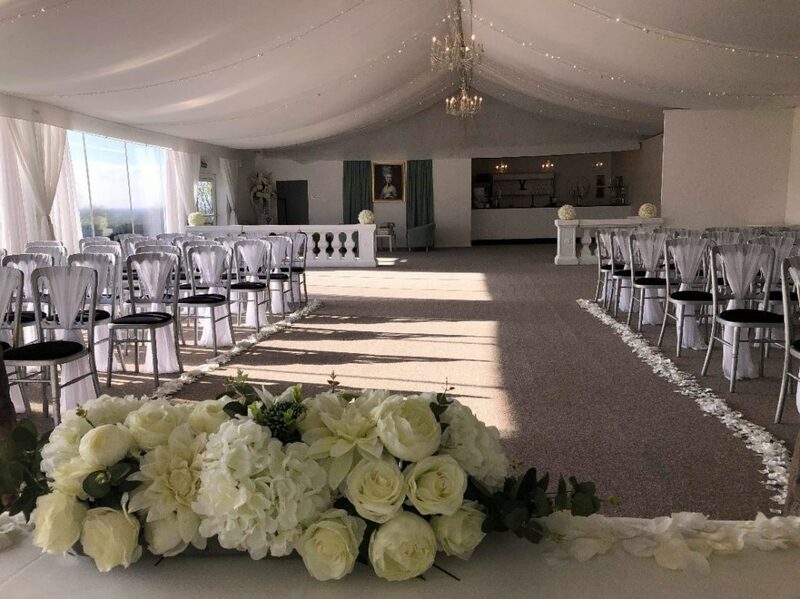 Our marquee is now licensed for civil weddings, as well as the Great Hall, and over the winter we have been making some changes to make it a more welcoming environment for those lovers who wish to tie the knot. For more information, please send an email to Weddings@tutburycastle.com. This photo gives an idea of the sort of thing that wedding couples can expect. Myself and the whole Castle team look forward to seeing you all soon!